Yesterday was my birthday. I am 38 -- and I can honestly say that this is one of my most favorite ages to be. I feel fabulous. I have more energy and confidence than I did at 28, and I am just comfortable with myself and where I am in this beautiful life. Tom gave me a wonderful gift this weekend-- a weekend away for a bit of R & R. We didn't even leave the area since we just returned from 8 days in Florida, but it was A-mazing. We went to the gorgeous Inn on Broadway in the city. The inn was the former University Club, and it has been beautifully restored and is just an elegant inn with outstanding service and accommodations. It was perfect for a romantic weekend away. The inn is just around the corner from coffee shops, restaurants, and more. I loved the fact that we were across from a very old church. The churchbells were beautiful to listen to! We also went to the Tavern 58 at Gibbs, which is near Eastman Theater. Dinner was incredible. I had the surf & turf, which was a filet with lump crab stuffed shrimp. DELICIOUS. The Espresso martini was a delight, too! This is a very quaint and rustic place-- and Melissa, our server, was top notch. They even brought us complimentary champagne garnished with strawberries when they found out we were celebrating my birthday. What a nice surprise to see a friend while we were leaving Tavern 58! Heather Saffer, winner of "Cupcake Wars" on the Food Network and former cupcake baker turned frosting line owner and author was there. Speaking of Heather, she has a new book! You can head over to Amazon or Barnes & Noble to buy The Dollop Book of Frosting: Sweet and Savory Icings, Spreads, Meringues, and Ganaches for Dessert and Beyond. The book, which I am ordering this week, features all sorts of neat recipes. Heather's line of gluten free, all-natural frosting is also available in select stores. CONGRATS on the new book! Another little local stop was to the Culver Road Armory to go to Alex and Ani. Ben wanted to give me something Yankees related for my birthday, so Tom told him he would pick something out. 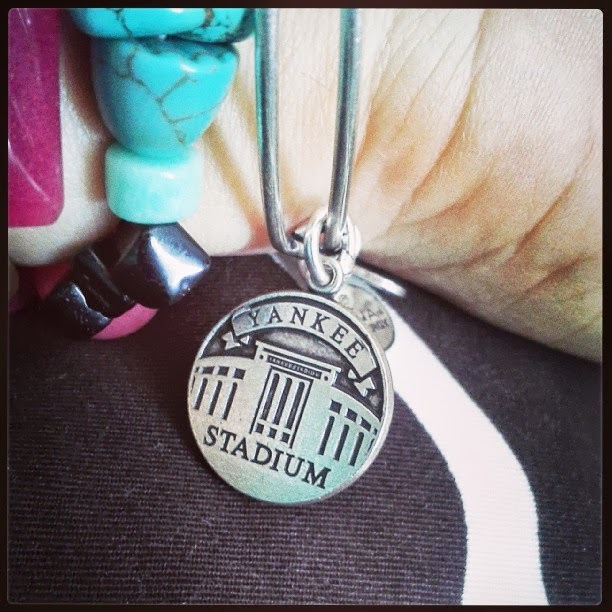 Above is the Yankee Stadium bangle in Russian silver. I LOVE Alex and Ani and this was a fun little stop on Saturday. On the way home, we stopped at Irondequoit's new gem, Atlas Eats, for a piece of birthday carrot cake to have for later. Delicious! If you have not been to Atlas Eats, do yourself a favor and go! They are located at the corner of Rawlinson and N. Clinton and if you're in my neighborhood, you can easily walk or bike on over. They are open Thursday through Sunday. I've been there for breakfast as well and can highly recommend it!